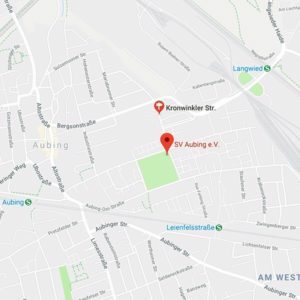 Are you struggling to find somewhere to play football in Munich without the hassle of having to find a team? Or without having to sign up to fixed training times for a club? With CeleBreak, you can sign up to play football in Munich in 7-a-side games as and when suits your schedule. We welcome all levels of play at our matches and one of our dedicated organisers will welcome you to our community and play alongside you on the pitch! We arrange the pitch, bibs, balls and create the teams. All you have to do is sign up on the CeleBreak app and be at the pitch ready to play! Our team at CeleBreak works hard to make playing 7-a-side pick-up sessions enjoyable and stress-free for each and every one of you passionate about football. We welcome players aged 18+ and all levels are able to play in our matches. We make it possible for you to sign up to play in 4 simple steps. Step 1 is to download the CeleBreak app which is available for free on the App Store. Step 2 is to select the game you wish to join and step 3 is to sign up for this game. Then, the final step is to simply come to the pitch where you will find our organiser and your teammates! Importantly, our meet time is 15 minutes before kick-off. This provides sufficient time to warm-up and a chance to chat with some new people. 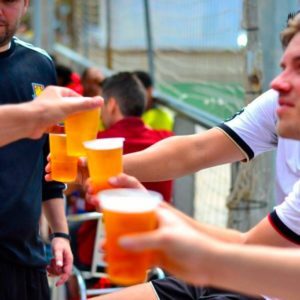 Our matches last for 60 minutes, giving you plenty of time to show off your skills and socialise afterward. Perhaps with a nice cold beer! First, access our app here .The app will sign you up through your Facebook account to make it more straightforward and less time consuming for you. 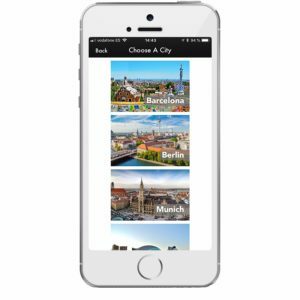 Once you have downloaded the app, you will be directed to the ‘Choose a City’ page where you should select Munich. Next, the app will display the available pick-up sessions. The location, time of the session and the number of players are visible on this page, making it easier for you to choose a session to suit you. Once you have selected a match, click ‘JOIN GAME.’ Then, you will be directed to pay online via the app. Each game costs 6€ per person which must be paid for through the app prior to your match. The award-winning ESV Neuaubing pitch, located on 25 Kronwinkler Str., 81245 Munich, Germany. 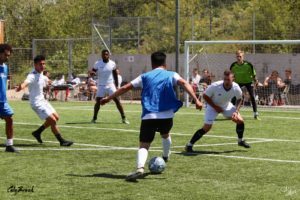 This renowned pitch won the European Lotteries Sports Award for its project ‘Sports United.’ The initiative seeks to offer real integration opportunities to refugees and asylum seekers in and through sport. In addition, we also play at FC Kosova München E.V, located on Papinstraße 22, 81249 Munich, Germany. Not only do we offer a unique experience for all people passionate about football, we also photograph and video some of our matches. We publish them on our website and are visible under the ‘Gallery’ tab. Our dynamic app makes it easier than ever to sign up for our games which brings new people together to add to our lively football community. As for now, we are focusing on our pick-up sessions based in Munich. But, do make sure to keep an eye out as our leagues will be starting in the near future! We look forward to seeing you on the pitch soon!